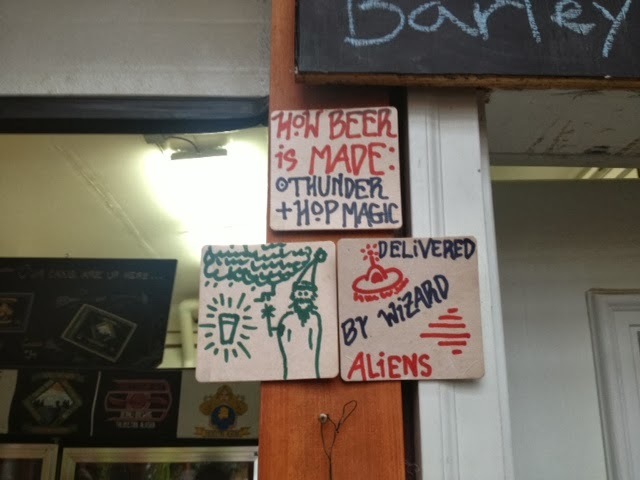 I love Talkeetna. It is such a quirky Alaskan town. Aside from having a cat for a mayor, good taste in beer, and priorities consistent with mountain climbing, the people just know how to enjoy life. 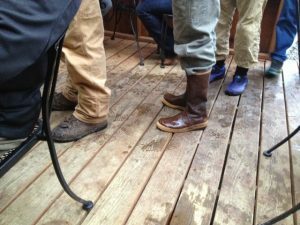 I have always thought if someone wanted to get a sense of true Alaskans they should study their footwear, and Talkeetna always offers up the best of the best! 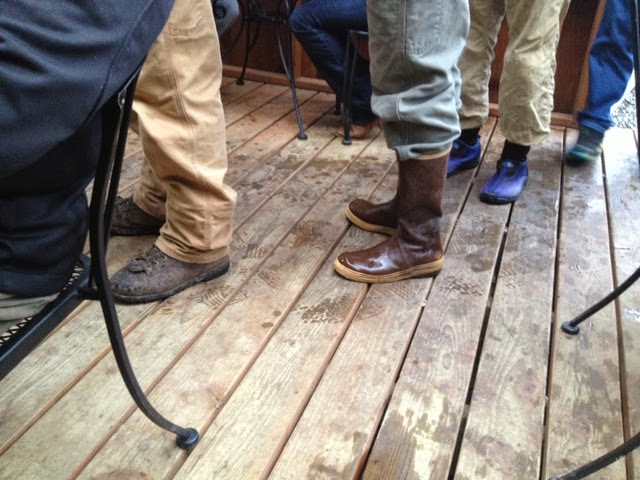 Talkeetna beer line with all the boots made for drinking! It is a 3 hour long adventure with 9 separate zip-lines, several rope bridges and platforms, and one small rappel. Jaz was not up for zip-lining in a downpour, so we had breakfast at the Talkeetna Roadhouse and bid her farewell. 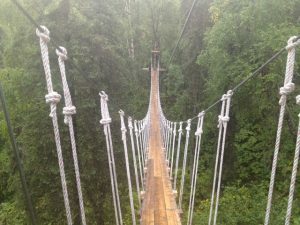 I was having second thoughts, not because of any fear or apprehension towards heights or zip-lines, but because it was raining so bad and the tickets were so expensive ($150/person). I wanted my trip to afford a view of the largest mountain on the continent, and rain was dampening that experience. 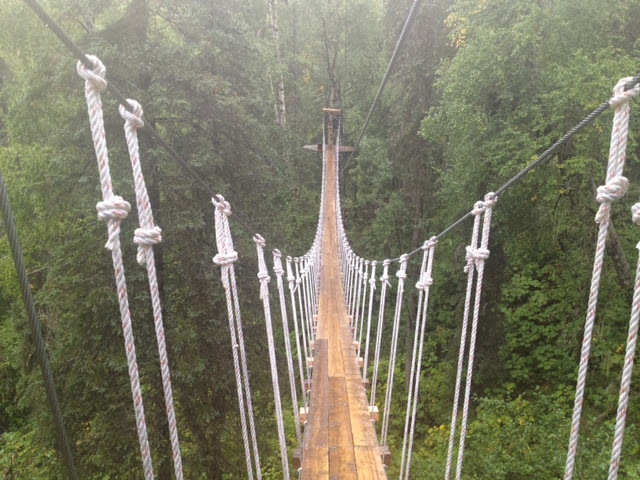 We checked into the office and found the tickets were non-refundable – it was settled, zip-line in the rain. The group was very friendly, and informative. I was worried that my poor hearing would get in the way of critical instructions, but it became apparent that these folks were safe, relied on hand signals for the distances, and very thorough. 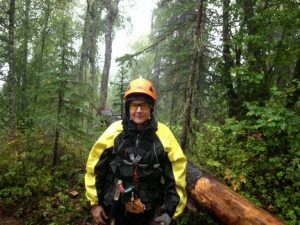 They suited us up in interesting harnesses (more elaborate than climbing gear), helmets, and special gloves with heavy duty leather patches over the palms. Our group size was only six; on account of the platform size between lines, two were employees. The ride was exhilarating! I do have a fear of heights that always makes my knees knock whenever I confront it, but even so, the ride was spectacular. The canopy was so thick, that even if it was a sunny day, all would only see a strip of blue at the tops of the trees. It was more like racing through the trees and forest than anything else. There is one small lake you cross, and Mt. McKinley can be seen on a clear day, but otherwise, this was a fast and furious travel through the trees. The lines get longer and faster as you go, so you get to work-up to not being scared shitless by the time you get to the fastest line. I say this, because unlike the zip-line I tried at Park City, Utah, this one is totally controlled by you. You were responsible for your speed, stopping, and falling short of the platform. You had a harness on with two hooks. When it was your turn you stepped up on a log and hooked onto a small cable skate, then sat down to put your weight on the cable. You put one gloved hand in front of the skate, and one behind. This kept you from leaving the platform before it was time. When it was time to go, you put both hands on top of the skate. Gravity sent you down the cable. At some point, when you needed to apply brake, you put your left gloved hand on the cable behind the skate and used friction to slow yourself down. The harder you squeezed the cable the slower you went. If you stopped short of the platform, you needed to hand-over-hand pull yourself the rest of the distance. Sounds easy, right? It was easy in theory, but if you aren’t the most coordinated person, it takes a little practice. The cables were wet, so you went faster. Additionally, your body could easily spin clockwise or counterclockwise, so you needed to be careful. But it was a blast! I highly recommend you do this when visiting Talkeenta, rain or shine. It made us giggle like children and it was well worth the money! My philosophy – I would rather slow down too much and have to hand pull myself the last couple of feet than slam into a tree (apparently this has happened). 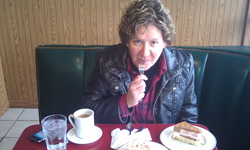 It is a simple operation that relies on you paying attention – no auto-stop here. It was a wonderful way to end the trip. Aside from a sheet of water hitting me in the face (when I was the first to do a long cable line that still had a lot of water on it), the zip-line was perfect. We road back to Anchorage uneventfully. The rain stopped about 45 minutes outside of Anchorage. The entire garage was filled with drying gear for two days.